There’s no doubt that routine physical activity can lead to a longer, healthier life. Taking time each day to walk, run, play a sport, exercise or just get outside can help to prevent chronic diseases like diabetes, obesity and heart disease. It also helps to strengthen bones and muscles, improve mental wellness, and even reduce the risk of premature death. Fortunately, summertime in the North Country provides great conditions for residents to spend time outdoors and be physically active. Beginning this month, temperatures rise into the 70s, 80s and even 90s throughout our region and daylight hours increase, giving us all more time to enjoy the outdoors. Lakes, rivers, and waterways also begin to warm up, creating the opportunity for more physical activities like swimming and kayaking. However, you don’t need to be particularly adventurous or athletic to reap the benefits of physical activity. A leisurely walk around your neighborhood each day can make a significant impact on your physical and mental health — and you can even accomplish it while running errands! A number of neighborhoods in Jefferson, Lewis and St. Lawrence counties offer a walkable living environment. These are the most walkable neighborhoods in our region, scored from zero to 100 based on how many errands can be accomplished on foot. 100 is the best score possible. See more at www.walkscore.com. While summer is a great time of year for exercise and outdoor fun, it is also a season with higher than average rates of injuries, accidents and other health problems. 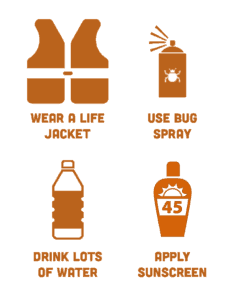 For summer seasonal wellness, it is important to drink lots of water, apply sunscreen, use bug spray, and wear appropriate safety equipment for activities. The National Safety Council maintains a list of safety tips for fireworks, boating, bicycling and many other summer activities on its website. For more information, click here. What can I do this summer? Summertime is prime time for local festivals, fairs, parades and carnivals. Not only are most of these attractions family friendly, but they are also great places to meet new people and interact with friends, family and neighbors. Here in the North Country, county fairs are scheduled in Jefferson, Lewis and St. Lawrence counties, and many more parades and festivals will take place in towns and villages throughout the summer. Extra tip: If you can, pack a lunch to save some money and avoid unhealthy options at the venue. If there is one thing our region has an abundance of (other than snow), it’s history! There are dozens of museums and historical sites across Jefferson, Lewis and St. Lawrence counties waiting to be explored. Walk through a War of 1812 battlefield, cruise around Boldt Castle and other historic homes along the St. Lawrence River, or trace the Underground Railroad on its route through the North Country. No matter where you choose to visit, exploring our region’s history is a great way to stimulate both your mind and body. For a list of local historic attractions, click here. Believe it or not, gardening can help keep you physically fit, lower your stress levels, and give you a sense of accomplishment. It’s also a great way to spruce up your home and even save money on food! Growing your own fruits, vegetables and herbs is a healthier, less expensive option than buying them from the supermarket. Don’t have a yard? Don’t worry! There are many ways to start your own garden, even if you have to do it indoors. Local agencies like GardenShare, Inc. in St. Lawrence County and Cornell Cooperative Extension of Jefferson County offer gardening advice and assistance for those who need help. Camping with family and friends can be a great way to relax and get away from some of the stresses of daily life. Whether it’s in your back yard, a public campground, or deep in the woods, there are many places to camp in the North County — and many are free! While you’re out camping, take some time to hike, fish, boat or be active in other ways. Click here for a map of state campgrounds. If you can set aside time for some volunteering this summer, we guarantee you won’t regret it. It’s always a win-win experience — your community benefits from your service, and you walk away feeling proud that you helped others. Whether it’s a simple act of kindness to a neighbor or a summer-long community project, your summer will be happier and healthier with a little volunteerism. Organizations like the United Way of Northern New York can help you find a volunteer project that fits your interests.